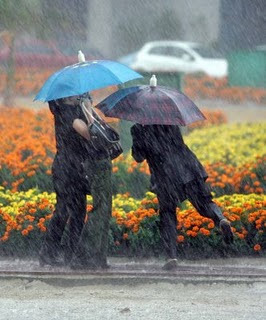 Rain forced 20 per cent of people to cancel their meetings, and spend time on twittering. The impact of the heavy downpour in the UAE on Tuesday was also felt in the form of a rain of reactions on the Emirati zone of the cyber socialising world. Dubai-based Jordanian entrepreneur Malik Shishtawi appeared on Twitter, shocked at what happened to the UAE in just two days of the rain. ÒI can't imagine what one week of rain can do,” he said. “A weather-induced laziness was driving people away from work,” stated Baher, a creative professional in a Twitter discussion on the correlation between the rain and increased Twitter activity in the UAE. “The rain definitely forced 20 per cent of people to cancel their meetings, and spend time on twittering,” he said. The rain that heavily hit all the emirates, filled with nostalgic feelings in the mind of Indian expatriate Muneer Othayoth. For Asik Mohamed, the rain in Dubai was like something unusual feeling as happens in India. But Sheryl D'mello, is currently in Mumbai, was missing the rain in Dubai as she came to know about it through friends and media reports. Radio presenter Joshua Anderson tweeted, “I love it when it rains in the sand pit of Dubai. Cyber social Ahsanuddin hoped the rain would continue for a few days more. The heavy rain in Dubai, for Jean-Pierre Ziegert, was like people get two metres of snow out in Switzerland. “Just when you thought the temperature was going up, the rain Gods surprised us,” tweeted business specialist Manesh Mahatme. Ashyrawr got home from school early on Tuesday. “I welcome the rain again and beg it to unleash its wilderness, even though the streets and roads are flooded to the extreme,” she tweeted, and sensed a severe summer in the near future. Sabah Ibrahim preferred to go for driving lessons in the fabulous rain, on slick-wet roads. Noaf Ereiqat also loved driving in the rain. The dashboard of Saleh Agha lighted up like a Christmas tree looking good in the rain. Rima Salman on the Facebook commented that she was swimming in the rain and enjoying the traffic. And Richa Sankpal was experiencing rain in the middle of the desert, as she tweeted. On the other hand, a corporate cyber social has posted seven photos, depicting t he rain that disturbed life in the emirates, on the Facebook in an album titled, "Dubai and Sharjah, Rain These Days”. Ahmed El-Garhy urged cyber socials to watch a video footage posted by an amateur videographer. Reva, producer and RJ for Radio Hello 89.5 FM being aired from Fujairah, came out with a surprisingly different experience. She could find no trace of rain at all on the highway to Dubai, near the desert in Al Dhaid area. “Roads were dry and there was no rain in this part of the UAE. 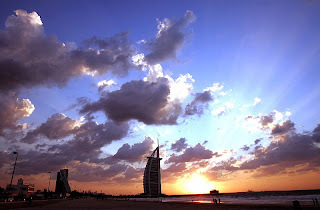 There was awesome skyline on the way to Dubai after Dhaid, but skies looked threatening,” she tweeted. Jay Mathur also observed that rains in Dubai seemed to have calmed down, but the roads in and out of the city were in mayhem. “Guess the deserts can’t handle a little bit of rain,” he tweeted. Jasmine tweeted that sting was coming in Dubai due to rain, and she hoped no rain and storm on March 4.Ó In the meantime, many cyber socials re-tweeted media coverages about the rain flood hotspots.